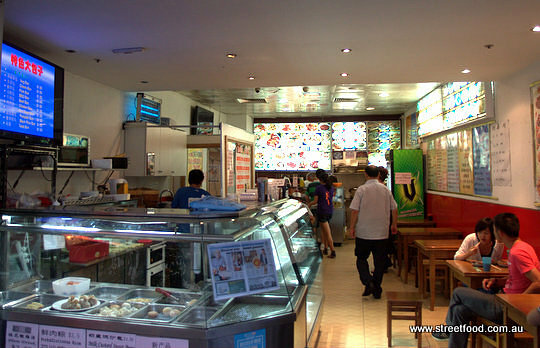 George Street at Central is one harsh spot for a restaurant, yet HLJ Asian Express thrives. The menu has grown over time to cover three walls and includes noodle soups, roast dishes, stir fries and Shanghai style street food snacks and side dishes. We've eaten at HLJ about six times now and there's still a few dishes on our 'never-seen-that-before-must-try' list. There's nothing we love more than a culinary lucky dip. Rice cakes with spinach and pork - $8.50. 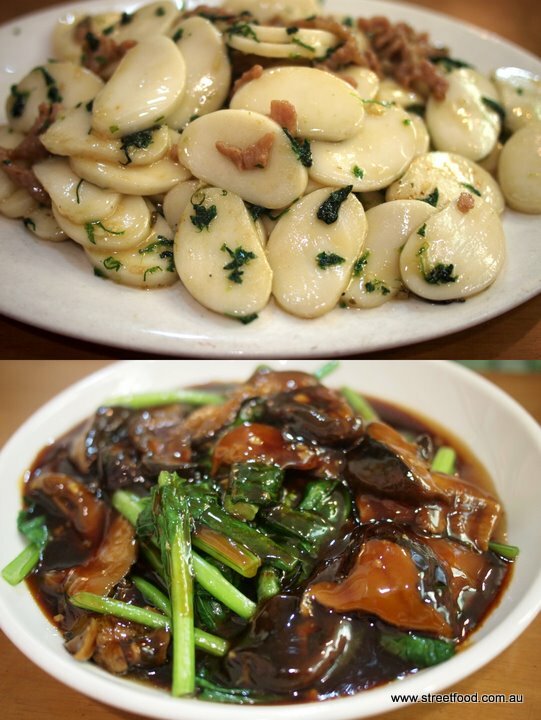 Rice cakes stir-fried in a healthy slick of garlic-flavoured oil with a little minced pork and some greens. Very filling. We liked this a lot. Baby vegetables with mushroom - $8.50. In the picture in the menu this dish was a purdy flower shape, we got the brown version instead. The veggies were more 'tweenie' than baby', but the mushrooms were divine, served in a plain gooey sauce with a bowl of rice on the side. A meal on it's own. Wraps - $4.50 for one or $8.50 for two. These aren't on the main menu on the back, they're on a poster on the wall to the side. The 'wraps' are lovely soft savoury pancakes that reminded us of the those used in Peking duck, they're fresh and light. Inside is the filling of your choice ( egg, pork, veggie, chicken, stomach, elbow or beef) with lettuce, a few bean sprouts and a little hoisin sauce. These were quite tasty and great value, definitely worth a punt. We went for an egg wrap and pork wrap. The pork roll was the favourite - with rich slices of a type of pork terrine, nicely balanced with the fresh lettuce and soft pancake. Hoa Jian dry rice - $9.90. A plate of plain steamed rice topped bits of mystery meat and peas in a simple brown sauce. A simple, homely and filling dish that we can imagine nanna making. Green Bean with Szechuan - $10. An excellent version of one of our favourite dishes. It's not too salty as green bean dishes can be. There's a nice dark soy sauce with fresh and dried chili, and a just a little minced pork to give it some balls. 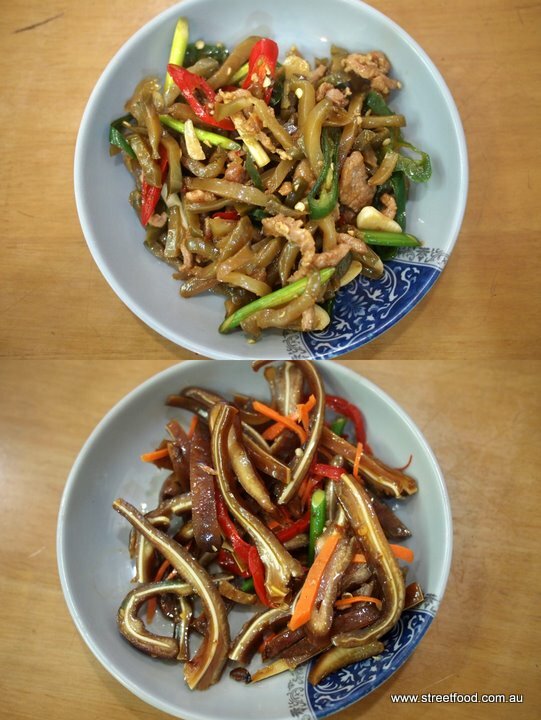 We had no idea what Chinese style elbow ($12.80) was, so we had to order it. It's a stewed pork kind of dish, in a plain brown sauce, balanced with some green veggies. There's an (un)-healthy layer of fatty skin on top of generous hunks of porky flesh. With a splash of dark vinegar this dish is a amazing. 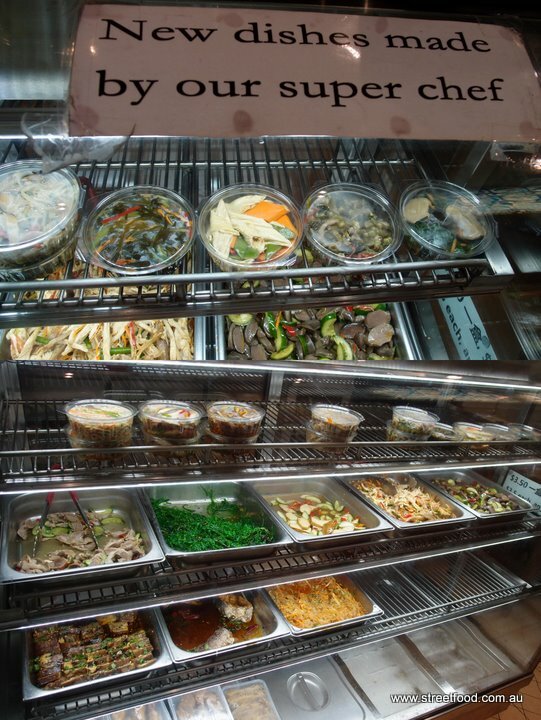 As well as hot dishes there's a cabinet of cold sides made by a super chef. After our final visit we walk home as the sun sets on the first sunny and not disgustingly humid afternoon that we can remember in months. Summer in Sydney 2012 - you sucked. 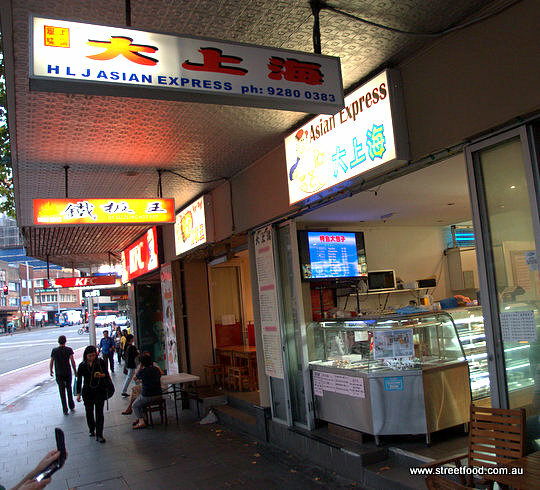 HLJ Asian Express is at 894 George Street, Ultimo\Central. Phone 9280 0383. Note it adjoins DY Sizzling Hotpot, you can order dishes from both joints. I am so checking this out at lunch today! That rice cake dish looks fabulous! 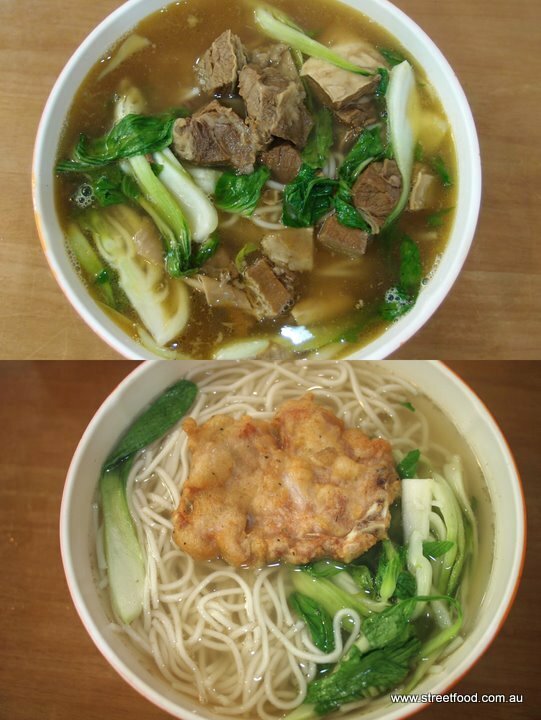 Walked past those Chinese places many times but glad to see some foodie shots of what they serve. The rice cake and wraps look mighty fine! Going to give this place a go tonight...the rice looks so good...comfort food!